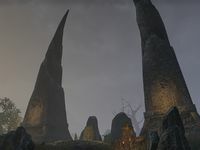 Fang Spires is a shrine dedicated to the Ghost Snake, the divinity worshipped by the Mabrigash Tribe. It can be found in the Vale of the Ghost Snake, southwest of the entrance to Darkshade Caverns. You will be directed to Fang Spires during The Trial of the Ghost Snake. The Ghost Snake will appear here, and you will be forced to fight his Shadow Snake aspect. A Time Breach can also be found here during The Shattered Staff as part of the Psijic Order questline. Unlike most unmarked locations, Fang Spires is only named in dialogue and quest stages. The name never appears through the UI. This page was last modified on 27 May 2018, at 17:15.